The Radeon VII has finally arrived and we are now able to tell you about AMD has done with 2nd Gen Vega. For starters, the Radeon VII graphics card is the world’s first to be powered by a 7nm GPU. The move to 7nm was a big deal for AMD as they were able to shrink the Vega GPU die from 495mm2 to 331mm2 while enhancing the Vega architecture. 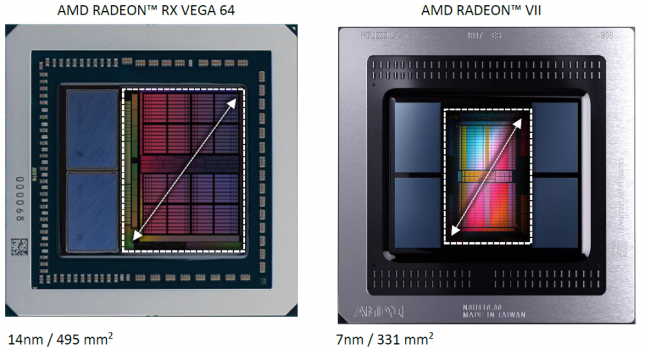 This has allowed AMD to increase frequencies and reduce latencies in a number of key areas. AMD was also able to increase the bandwidth for the ROPs for improved gaming performance and increased floating point and integer accumulators for better compute performance. 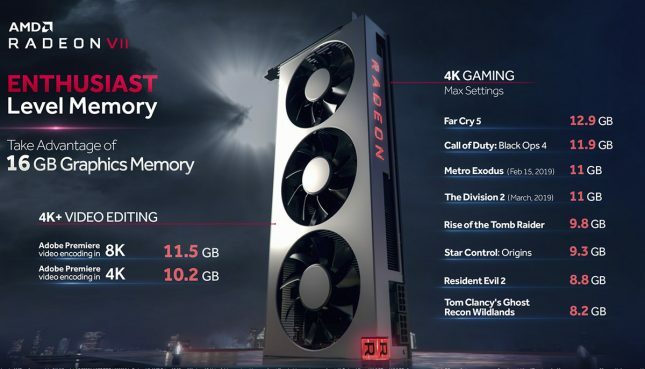 The change that is that AMD is only offering the Radeon VII with 16GB of memory. The move to 7nm freed up more space and that has allowed AMD to put two more stacks of HMB2 memory on-board for a total of 16GB of memory. AMD firmly believes that 16GB of memory will be very handy for gamers and enthusiasts in the years to come. AMD sent us the infographic below that shows they are seeing up to 12.9GB of graphics memory being used for 4K gaming with max settings and over 10GB being used with 4K and 8K video editing in programs like Adobe Premiere. Most games aren’t really playable at 4K max settings at smooth frame rates, so does that even matter? Having 16GB of HMB2 memory on Radeon VII is costly and one of the reasons that this card is priced at $699.99. The Radeon VII has 60CUs for a grand total of 3,840 active stream processors running at up to 1800MHz. 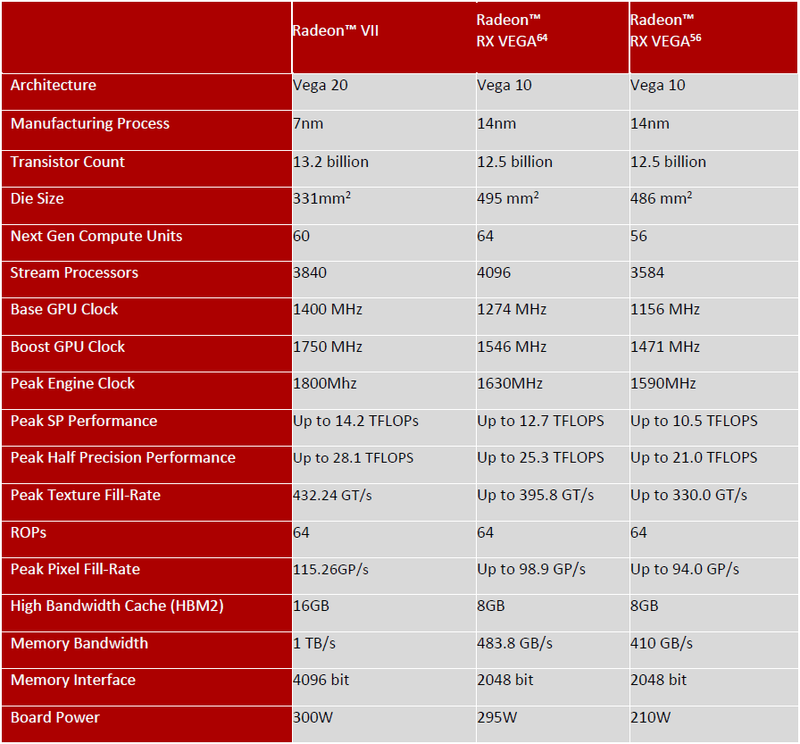 The AMD Radeon RX Vega 64 has 64 CUs and 4,096 compute units running at up to 1630MHZ. That means we might see another sku down the road that is slightly faster as we know the fully featured Vega 20 GPU has 64 CUs since it is used on the Radeon Instinct MI60 card. Despite having fewer stream processors the Radeon VII packs a more powerful punch than the Vega 64 as you can see from the table below. 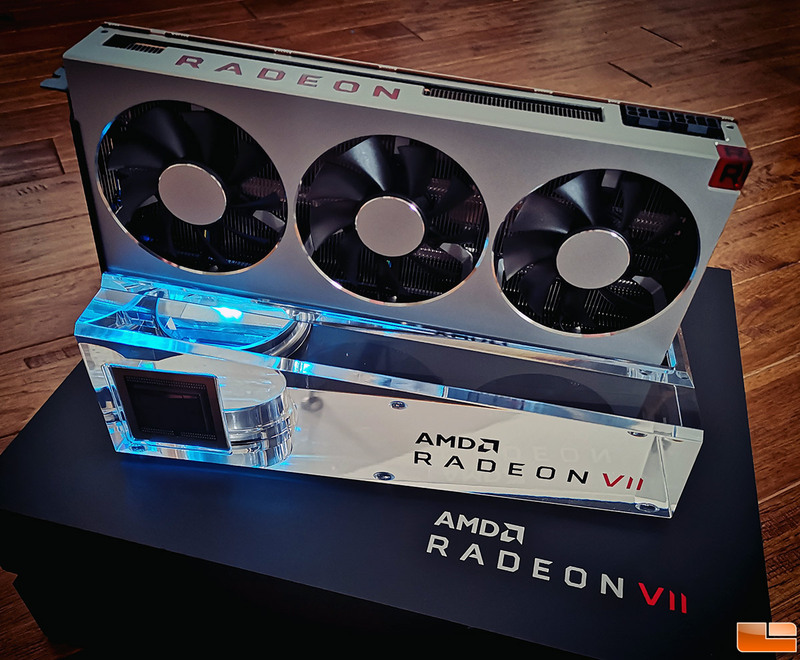 We’ve already covered the AMD Radeon VII in our unboxing article earlier this week, so we will get straight to it! Let’s take a look at the test system and then see the benchmarks!